In fantastic news, DOC have just put out a press release, stating that rock wren have been successfully established on Secretary Island (New Zealand's 3rd highest island). This is an insurance policy against their further depletion on the mainland. It is well known that Aotearoa holds a large number of unique species found nowhere else on earth. What many of us do not know is that without protection some of these species will go extinct within the next 50 years. Sadly, most of these critters are small and cryptic and therefore will disappear unnoticed. Thankfully a generous group of individuals have not only noticed our pocket sized alpine rock wren (Maori name tuke), but they have taken steps to prevent this unique species disappearing from the face of the earth. Fauna Recovery New Zealand and Fiordland Helicopters have worked closely with the Department of Conservation over the last decade in an effort to better understand this species’ current situation, and to improve its chances of long-term survival. As part of this, the team translocated 41 rock wrens to Secretary Island at the mouth of Fiordland’s Doubtful Sound over 2008-2011. The only introduced predator present, the stoat, is controlled to levels far below its numbers on mainland Fiordland. DOC Ranger Megan Willans said “We are delighted to announce that translocation efforts have been successful and the first population of rock wren on an inshore island are establishing well. The increased safety of the island, a place where predators pose a lesser threat, provides insurance against the birds’ steady demise on the mainland”. A team of bird surveyors found sixty-six rock wrens on Secretary Island in April this year (2013), of which sixty-three hatched and fledged on the island – indicating the birds have settled in well enough to breed. You might ask who cares? Well aside from protecting wildlife and natural landscapes to maintain a healthy environment for us all, the rock wren is the only true alpine bird in Aotearoa and most significantly is one of the most ancient bird species in the world. Rock wrens are one of seven New Zealand wrens, a group of birds like no others in the world, forming the most ancient suborder of all song birds Acanthisittidae. They stem from a species present over 80 million years ago and have no close structural resemblance to any other group of birds in the world. Of the seven wren species that lived in New Zealand when humans arrived sadly the rock wren and the rifleman are the only two species surviving today. Rock wrens live in alpine and sub-alpine habitats throughout the western half of the South Island from the Nelson Lakes, through Westland to Fiordland. However, their distribution is now fragmented, and recent sightings indicate that about twenty percent of known localities have had no sightings in the past 20 years. The first attempt to translocate rock wrens to Anchor Island in Dusky Sound was unsuccessful. This was probably due to lack of alpine habitat and maybe an inadequate founder population, but this didn’t discourage Fauna Recovery New Zealand and Fiordland Helicopters from a second attempt. Secretary Island is the third tallest island in New Zealand offering a good network of sub-alpine habitat. Rock wrens are vulnerable to predation by stoats and mice. Both species prey on rock wren chicks and eggs on the nest and stoats also take adults at nest sites. Sometimes this has dire consequences for rock wren populations, as was observed at Homer Tunnel and the Gertrude Valley near Milford Sound last year. Camera footage at rock wren nests showed stoats to be a significant predator at nest sites for this population. The next challenge is to control predators to a level that protects rock wrens at sites on mainland Aotearoa where suitable habitat is plentiful. The Sinbad Sanctuary & Fiordlands hidden lizards from James Reardon on Vimeo. The headline, borrowed from the Newsletter of Fauna Recovery New Zealand, is alarmist perhaps but, who knows. The evidence of stoat predation in the Darrans is certainly bad news. Here is a Youtube clip produced by Forest and Bird's Sue Maturin, with graphic footage of stoat predation on Rock wren, and the obvious pain in the scientists eyes. Fauna Recovery NZ is an outstanding friend of NZ nature, they fly under the radar somewhat, at least in the public eye. Their newsletters are worth a read. I am waiting eagerly for the next edition which will hopefully document the results of the survey for Rock Wren on Secretary Island, which they are trying to establish as a safety net for rock wren should populations continue to shrink on the mainland. Lets hope Facebook can do for rock wren what it has done for Tunisia and Egypt;-). Some cool photos of Kerry Westons Phd fieldwork...and for some more pics check out Danillo Heggs site....Danillo's place is actually in my opinion the most inspiring New Zealand outdoors/tramping site there is, bookmark it now. A great picture of a Tuke on Avalanche peak taken by my Mum last summer. Good on you Mum 1) for climbing a mountain 2) for finding a rock wren! 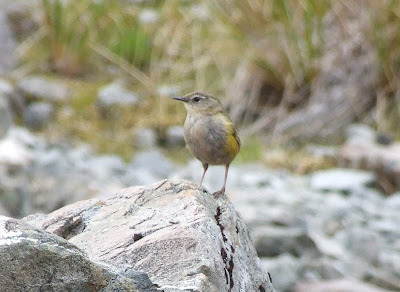 I have recieved these great reports about rock wren sightings in the Otira Valley. As one of our only alpine highways this is definitely one of the best places to view Tuke. It is also a place where there is talk of doing more to protect and understand them. In fact it is more than talk, the Arthurs Pass Community Centre protecting Raroa in the Bealey and surrounds no doubt aids the rock wren as does the trapping and 1080 programmes down the Otira. Soon stoat traps may be moving up the Otira to again secure this valley for Whio, Raroa and Tuke! James, reliable report from Robin Delamere, ex-DOC of 6 rock wren in Upper Otira Valley map reference 898110, 11.30 am, 9/1/2010, fine cool weather. Appeared to be pair with 4 immature young ones. Cheers. Hi Jamie, attached are two images (adult) I took this afternoon of Rock Wren in the upper Otira Valley. These are part of a family of 6 (2A 4J) found on that "island" section of moraine just above the "boulder garden" - as streams run both sides they might of created their own predator free paradise. Their nest is under some large rocks in the centre of their territory (they were circling it about 10m radius), they have used chamois hair taken from a decaying carcass about 400m higher up. I delivered them a Weka (road kill) and placed it high on the cliff above them in a predator free area with 360º clear view around - one of the Juv's followed me up there - be interesting to see if they use it. There is another pair (no Juvs seen) in that area of scrub/rock opposite the scree that runs off Philistine Bluff (about 400m downstream of bridge), they seem to be on the true-right (but that just might be their curiosity of me).